"Because the seeds of our future are sown in his past." Halo 2: Anniversary is the remastered edition of Halo 2. The game was released on November 11, 2014 as part of Halo: The Master Chief Collection for the Xbox One. Halo 2: Anniversary is the first Halo game to support Halo Channel, an Xbox One feature that was released alongside the game. As with Halo: Combat Evolved Anniversary, the Halo 2: Anniversary campaign has been visually remastered by Saber Interactive along with completely redone audio and the original soundtrack rerecorded by Skywalker Sound. Similar to its predecessor, Halo 2: Anniversary uses a combination of 3D models from several of the prior games (such as Halo: Reach's Grunts) as well as modified and all-new assets. Unlike the other games in the Master Chief Collection which run at a 1920x1080p resolution, the Halo 2: Anniversary campaign has a lower resolution of 1328x1080p due to stated technical problems that arose from running the twin graphics and audio engines at 1080p. The game nonetheless has a frame rate of 60 frames per second like the other titles in the collection. The remastered cutscenes have been pre-rendered by Blur Studio as opposed to being in-engine like those in most of the Halo games. Like Halo: Combat Evolved Anniversary, the game allows users to switch between the remastered version and a "Classic Mode" (also referred to as "Legacy" mode); both visuals and audio are remastered in the Anniversary mode but remain original in the Classic Mode. The switch between the two modes is more seamless than in Halo: Combat Evolved Anniversary, being instantaneous as opposed to the screen fading to black in the interim. Like Halo: Combat Evolved Anniversary and Halo 4, Halo 2: Anniversary contains hidden terminal videos; these terminals have been stated to be easier to find than before. As in Halo 4 the videos are hosted on Halo Waypoint, not on the disc, and as such require an Internet connection to access. The game also features its own set of skulls. Halo 2: Anniversary also contains a remastered version of Another Day at the Beach (a bonus video originally shipped with the Halo 2 Multiplayer Map Pack) animated by Blur Studio. In addition, two cutscenes were added to the campaign's beginning and its ending, linking to the events of Halo 5: Guardians. 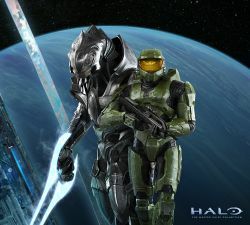 The Halo 2: Anniversary multiplayer has been stated to be based on a post-patch version of Halo 2 as rather than the shipping version. The game also has an online co-op mode. Split-screen multiplayer is laid out in horizontal view instead of the original vertical orientation. All original multiplayer maps (including the extra ones in the DLC map packs and Halo 2 Vista) are featured in the classic multiplayer mode. Various Elite armor permutations available in the Halo 2: Anniversary multiplayer. Six of Halo 2's multiplayer maps have been completely re-imagined in a separate multiplayer engine described as a combination of the multiplayer of the classic Halo 2 and that of the more recent Halo titles. A Forge mode is featured in the six re-imagined maps. Certain Affinity president Max Hoberman, one of the multiplayer design leads on the original Halo 2, helped 343 Industries design and create the remastered multiplayer component. Many of the added features in the remastered maps were proposed for the original game but ended up being cut; thus, 343 Industries considers the remastered component a "Director's Cut" of sorts. The developers' stated goals for the remastered maps were to expand upon the core Halo 2 experience, create the definitive version of each of the remastered maps, and to approach the remastering as more of an upgrade than a remake. Multiple aspects of the sandbox were tweaked to both improve and "modernize" the gameplay, although the goal is to remain faithful to the original experience. Some of these improvements include a boost to player speed, making the magnum more powerful and the addition of the assault rifle as a mid-range weapon option, something the developers found lacking in the original. The silenced SMG has also been added along with the newly introduced M274-M Gungoose. As an added feature, players are able to choose their weapon set upon spawning, similar to the loadout system in Halo: Reach. According to Max Hoberman, this feature was originally designed for Halo 2 but was ultimately cut. Hoberman hesitated to call the weapon sets "loadouts" and underscored that the system is designed to be more evenly balanced; e.g. Lockdown's weapon sets include a choice between the SMG, plasma rifle and magnum. The human weapon sets equip the player with two frag grenades while the Covenant ones have the player spawn with plasma grenades. Like earlier games' multiplayer customization includes nameplates, service tags, armor permutations for both Spartans and Sangheili, and emblems. New features to customization include clan tags and in-game avatars. Though most of the map geometry—including "skill jumps"—remain intact, the remastered maps contain a number of gameplay tweaks (such as additional cover) along with new "dynamic features", some of which Max Hoberman proposed to be added in the original Halo 2. These include the addition of a large energy shield in the center of Zenith, the remake of Ascension, which can be triggered by three panels across the map, and three stalactites which can be dropped on players on Lockdown, the remake of Lockout. Most of these new features can be disabled via Forge for an experience closer to the original game. Other additions to the remastered multiplayer include the name of the segment of the map that the player is currently in being displayed near the motion sensor as in Halo: Reach. Gametypes such as Infection, Race, Ricochet and Team SWAT have been added to the remastered multiplayer. There are two player models which players can choose from, the standard SPARTAN model or an Elite model. Unlike previous games, armor cannot be customised. All armor permutations do not have any effects on gameplay. Forge returns in Halo 2: Anniversary with many more improvements and additional features. New features include simple scripting objects (such as switches which can be used to trigger various actions) and mirrored versions of objects. Additionally, the budget can now either be limited on the amount of objects placed in a map, or how well the map will run with the amount of objects placed. Three Skybox-only maps have been added to allow players to build and create with little restrictions. The Arbiter and Master Chief, with Installation 05 and Substance in the background. While Saber Interactive produced the cutscenes in-engine in Halo: Combat Evolved Anniversary, digital animation company Blur Studio (who previously worked on the Halo Wars cinematics) was contracted to create pre-rendered CGI cinematics for Halo 2: Anniversary. This was a considerable undertaking, as the game's cutscenes contain a total of 58 minutes of footage. However, since the template for the cinematics' structure and composition already existed in the form of the original Halo 2 cutscenes, it was easier for Blur to focus on issues like visual fidelity than in a typical project in which they are forced to work with little to no such source material. The character animations were created through motion capture technology; the new models for certain characters, such as Miranda Keyes and Avery Johnson, are also modeled after their motion capture actors. The action scenes, which involve a great deal of movement on part of the characters, proved a challenge for the actors, particularly because the facial and bodily performances were captured separately. In one scene (the closing of Quarantine Zone), for example, Damion Poitier, the motion capture actor for Sgt. Johnson and the Arbiter, is fighting "himself". The soundtrack in Halo 2: Anniversary is in surround sound and has been completely re-orchestrated by Skywalker Sound, with several new tracks exclusive to the remake. Steve Vai, who worked on the original Halo 2 original soundtrack, was hired to re-record his original guitar tracks for the remastered soundtrack. Two new tracks by Misha Mansoor replaces the exclusive songs by Breaking Benjamin and Incubus in the Anniversary mode; the original tracks are retained in Classic mode. 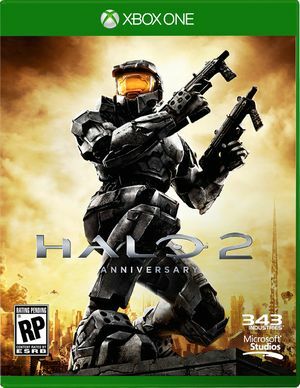 An official Halo 2: Anniversary Original Soundtrack was released alongside The Master Chief Collection on November 11, 2014. The soundtrack is available as a double CD, digital download, and a limited edition vinyl record. Every sound effect from the original Halo 2 has been redone, including weapons, vehicles and ambient sounds. The Anniversary mode also features an overhauled audio engine, with new reflection and level of distance systems to more realistically model the sound effects' interaction with the environment, accounting for level geometry and distance in the propagation of weapon sounds. Each weapon's sound effects have been changed to make every weapon seem more intimidating. The audio team disseminated the original sounds in detail and attempted to find specific identifying characteristics of them to emulate in the new ones. Similar to the weapon sound effects in Halo 4, source material for the new sounds was recorded with actual weapons fire. The developers picked weapons they felt had distinctive firing reports, including the Thompson submachine gun, the Heckler & Koch MP5 and the M1 Garand. New source material for the energy sword's sound effects—which the audio team wanted to sound more powerful than originally—was created by recording the sizzling and crackling sounds created by placing ball bearings on dry ice. The toggle between the original and the remastered audio are tied to the graphics switch and cannot be changed independently.